Hunting Unlimited 2009 Game Review - Download and Play Free Version! 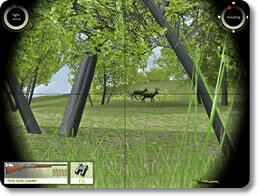 Venture into the Wilderness of North America in Hunting Unlimited 2009! Hunt in North America's most amazing environments - it's open season every day with this game! Experience endless hunts for 17 types of game including whitetail deer, moose, mountain lions, wild boar, bears, elk, turkey and even Timberwolves. This realistic 3D game will let you tackle extreme hunting environments, more than 85 missions and even tangle with the big beasts in Africa! It's entirely your own hunting trip; you choose what location and then hunt anywhere you want on the large, realistic maps. Choose from more than 31 weapons and accessories, including shotguns, rifles, bows and decoys. Walk, run, crawl and more as you search for the perfect shot. Visit the Target Range for practice or try Challenge Mode to complete hunting goals. Hunt in the Rocky Mountains, Alaska, Africa and more on the Free Hunt mode. You can even design your own perfect hunt with the Mission Editor. This realistic experience serves as an adventure and good hunting practice. Feel the thrill of the hunt as you pursue game across across areas you may never have hunted in like grasslands and mountainous terrain or through forests with plenty of trees and bushes to hide behind. This is a game hunters won't want to miss because you can hunt all year round and keep your shooting sharp! Heed the call of the wild and enter the wilderness now with Hunting Unlimited 2009! Hunting Unlimited 2009 is a thrilling hunting game that will having you hunting down everything from elephants to wild hogs. There are a host of locations to hunt in, ranging from the South Central Plains to the Pacific Northwest. Several tutorial missions teach you the basic controls, as well as some hunting tips and techniques. The different modes let you just right into the action, hone your skills, create your own missions, or setup your own hunts. A bullet cam lets you watch your shots in slow motion as you take down animals. This game provides an excellent hunting experience. To start hunting, you'll need a hunter profile. You can create a hunter profile that lets you set your hunter's name, as well as adjust their look. Once you've setup your hunter, you select the mode you want to play and any options for that mode. You can then begin your hunting trip. Depending on the mode, you may be thrown right into the action or have to do a bit of tracking and work to find your prey. The mode will also determine what type of animals you can catch. You have three tags, which means you can only “bag” (collect) that many animals. Sometimes these tags are only for a specific type of animal, while others they can be used for anything. Once you've finished bagging all the animals you can or run out of time, you can end the hunt and begin a completely new one. If You Were Shot, Would You Run in Circles? One issue when it comes to the gameplay is the behavior of animals. They often act is strange or stupid ways, such as running in circles after you've shot at them (which takes away from some of the realism). Hunting Unlimited 2009 contains a variety of levels in which you can hunt. These levels are locations all over the world that differ significantly from one another. They are also fairly large and detailed. There are lakes, rivers, trees, grass, and more to add to the realism and make you feel like you're really there. The locations include Alaska, the Northeast, Africa, the Southern Rockies, and more. The locations add of lot of variety to the game and each one feels unique when hunting. There are also several different modes to choose from when playing the game. The Challenges mode contains several tutorials that teach you everything from the basic controls to advanced hunting tactics. This mode also contains missions (more than 80 in total) that often put you right into the action. Some have you face off against dangerous animals like cougars and lions trying to maul you, while others have you hunting down animals like deer and moose. There's a lot to do, and your performance on these missions determines your score. Better scores unlocks more missions to play that are even more challenging. The controls in the game are fairly straightforward and easy to use (especially after playing through the tutorials). Hunting Unlimited 2009 plays very much like other FPS games, using the WASD keys to move and the mouse to aim and fire. The only issue when it comes to controls is when looking around/aiming. A tiny move of the mouse can cause a big jump in your view. You can adjust mouse sensitivity downwards to reduce the occurrence, but it can be annoying. 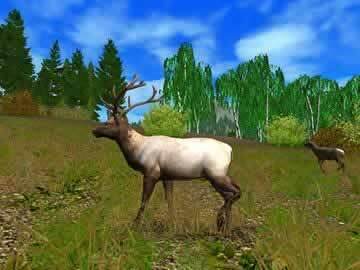 Hunting Unlimited 2009 is a good choice for anyone looking for a hunting game, but Hunting Unlimited 2010 provides everything that this game does and more. Hunting Unlimited 2010 is nearly identical and adds more missions, more weapons, and more animals. Both games have a ton of maps, animals, and weapons that add a lot of variety to the play and make each hunt feel different and unique. They have excellent tutorials to teach everything from basic controls to using items like calls and tracking animals. Both games also have similar issues with animal behavior and the presentation. You can try this game out and see whether you enjoy it, but if you're interested in buying and playing the game you'd be better off getting the 2010 version. View a few minutes of gameplay footage featuring a hunter taking down three elephants.